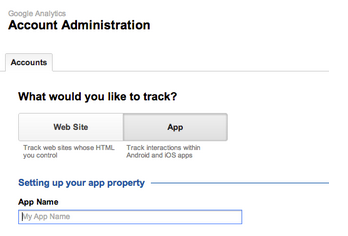 Google Analytics Mobile App Analytics (initially launched at I/O) out of closed and into open beta. We’ve listened to feedback from more than 5,000 mobile app developers during the closed beta, improved the product, and are now making it available to all developers and marketers. With the induction of mobile app analytics into the family of digital analytics at GA, we’ve introduced a new and improved sign-up flow that you will see whenever you setup a new entity on GA. In just 3 clicks, you’ll be able to set up your app analytics account, download the SDK, and be well on the way to tracking key metrics and finding valuable insights using our features. The mobile app analytics solution is made possible with our new Android and iOS SDKs which have been rebuilt from scratch. They are lightweight, powerful, and super easy to implement. The majority of the mobile app reports are available out of the box after less than 5 minutes of work implementing our new SDK (check out our developer guides for more details). 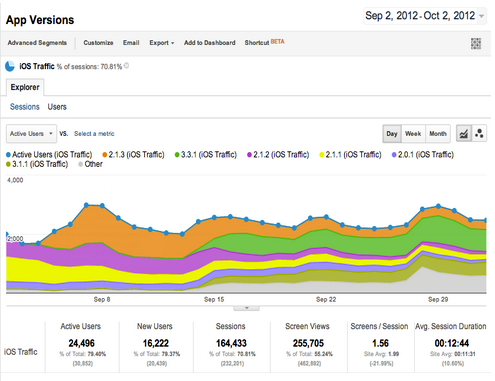 How quickly are users migrating to the latest version of my app? What’s the cannibalization effect among my multiple versions? How many users would be affected if I deprecated an early version of my app? You can create your own dimensions by which to segment your hits in every standard or custom GA report. Leverage your own business and customer data as custom dimension values to enable new possibilities for analysis and reporting. Naming and scoping of Custom Dimensions can be configured through the administration UI - no retagging needed! Other improvements include: more accurate & up-to-date mobile device library, armv7s ( iOS6) support, support for social interaction tracking, a more accurate Google Play conversion report and more. With this big step forward for Mobile App Analytics, we still have many more exciting features on the way and planned for the future that will add to the power and functionality of the platform. Look forward to improved integration with other Google properties like Google Play as well as brand-new reports that will provide a better understanding of your user acquisition, engagement, and outcome models. We hope that our product will give app developers and advertisers a better picture of users’ interactions as well as the end-to-end value of your mobile app. And in the long run, make mobile apps more beautiful and engaging experience for all users. With ever-expanding mobile application marketplaces (more than 600,000 apps on Google Play at the time of writing) and a shift in focus to mobile (more than 80 percent of marketers are planning to increase emphasis in mobile initiatives in 2013, according to recent research we conducted with ClickZ) measuring mobile is more important now than ever. With this, we are excited to be moving Google Analytics Mobile App Analytics (initially launched at I/O) out of closed and into open beta. We’ve listened to feedback from more than 5,000 mobile app developers during the closed beta, improved the product, and are now making it available to all developers and marketers.